People like to use fitness tracking information in a number of ways. The number of calories burned as shown by a fitness tracker is commonly used to reach a personal goal for weight loss or other training. The information can also be used to assess how hard a person is working in comparison to some other activity. However, many people wonder how accurate the calories calculation of fitness activity monitor is. A calorie is a unit of energy. The calories that are talked about in terms of human diets and exercise are actually kilocalories, but they are usually simply called “calories.” Simply staying alive burns a certain number of calories because bodily functions such as keeping the heart pumping require energy. Methods of estimating the number of calories required by a person doing absolutely nothing include the Basal Metabolic Rate (BMR) and Resting Metabolic Rate (RMR). Calories are burned above and beyond the BMR and RMR when a person performs activities. How strenuous the activities determine how many calories are burned. However, fitness levels determine how strenuous a person perceives an activity to be, which may or may not be a good gauge of how many calories are being burned. Fitness trackers attempt to calculate the calories being burned by using a set of variables, some that are pre-set and some that are input by the user. 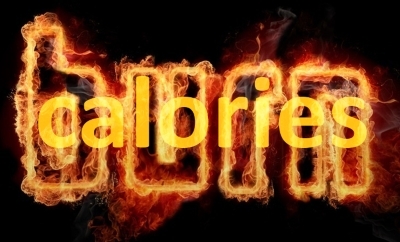 Factors that affect the number of calories burned include age, gender, weight, body composition, and exercise intensity. Heart rate is also a key piece of information when it comes to these calculations. Some of these factors are easy for a person to provide, such as their age, gender, and weight. However, things like body composition, or the percentage of fat that a person has, are not things that are widely known. Exercise intensity is also difficult to pin down because different people perceive activities differently. When a factor is not easy to figure out or the device is not designed to measure it, manufacturers set their activity trackers to assume a number. This number is based on scientific research, but it is typically an average or the most common number. This means that while it will be accurate for many people, there are those for whom the number will be wrong. The less the activity tracker has to assume, the better. This means that the more information that is input into the system that is specific to the user, the more accurate the readout will be. As general classes, activity trackers that measure heart rate are more accurate than those on gym machines, which in turn are more accurate than apps or online calculators. While the basic information that goes into calculating calories burned is usually the same, some fitness trackers arrive at those measurements by estimating other information. Pedometer-based fitness trackers use a combination of distance covered and steps are taken to estimate the speed, and therefore the exercise intensity, when calculating calories. The information on speed is added to the information that the user inputs, such as weight and age, in order to reach the estimated calories burned. The Fitbit One is a high-end fitness tracker that also functions to monitor sleep cycles. 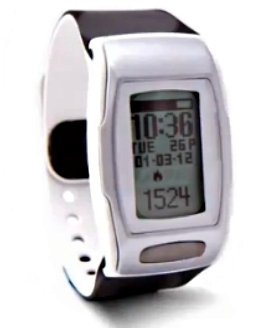 It is essentially a smart pedometer that measures activity by counting the number of steps users take. Since some activities are not easily estimated by this type of technology, the associated website where users can input their other fitness efforts is essential to its success. 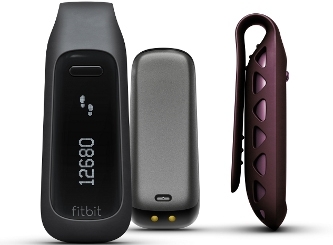 The Fitbit One must be worn on the body in order to track activities, but it can be worn in a number of different ways. The flash drive-sized tracker has a clip on the back for hooking onto a belt, waistband, bra or other clothing. It can also be placed in some pockets. A wristband is included for wearing the Fitbit One during sleep. The special accelerometer on the Fitbit One measures movement patterns. In combination with the number of steps taken and the speed of these steps, the device calculates calories. An included altimeter tracks when the user is climbing stairs, which increases the number of calories burned per step. The Fitbit One is 95-97 percent accurate in calculating the number of steps a user takes. Calories accuracy is not listed for the device. Buy Fitbit One activity plus sleep tracker, it is on sale now! The Lifetrak Core C200 is a wearable activity tracking device that resembles a watch. It actually functions as a watch as well so that users don’t have to wear both the activity tracker and a watch. 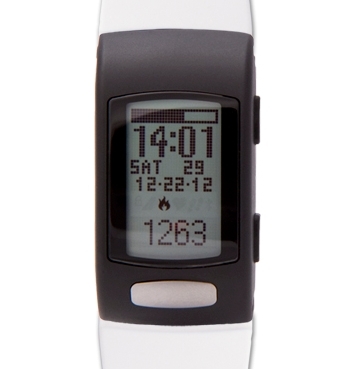 The Lifetrak C200 measures steps taken, distance covered, calories burned and heart rate. The Core C200 requires no setup, which is a bonus for some users. However, this means that the device is assuming certain values, which can mean that it is less accurate than a device that requires personalized information about the user. However, the fact that it measures heart rate is also important. In most cases, devices that measure heart rate are more accurate than those that rely on other figures. Calories accuracy for the LifeTrak C200 is not a listed spec. However, given that it measures exercise intensity by using steps and distance, which is an individual measurement, in addition to exercise or activity the Lifetrak series activity trackers allow for a more comprehensive calorie count by factoring in calories burned simply through living, this is a great tool to compare against the daily calorie intake. The device will also provide a more accurate calorie count by calculating the heart rate reading whenever it is taken. By adding the heart rate data, it can probably be assumed to be reasonably accurate for the average person. Remember to get the heart rate throughout the day and more frequently during a workout in order to have more accurate Calorie counting. People who are considerably over or under the “assumed” weight, body composition or age may find it less accurate. Also note that your body is always burning calories, even when sleeping or not in motion, the Lifetrak all day calories counter accounts for these calories burned, so don’t be surprised to see calories burned number on the device even you are not wearing the device. The Lifetrak C400 actually comprises two models, both of which are expected to available for purchase in June 2013. The Lifetrak C400 Fit and Lifetrak C400 Pace offer the option to include personal information such as weight, gender, and age. Combined with the heart rate monitor on the C400, this should make it more accurate at calculating calories. The other major difference between the C200 core and C400 models is that the Lifetrak C400 comes with Bluetooth LE capability. This can be used to send the data from the C400 activity tracker to any Bluetooth-enabled device.